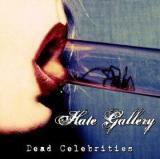 It’s not often that I get mailed a single as lavishly packed as Hate Gallery’s Dead Celebrity (Queen of the Damned) so let’s give these guys a break by putting a few words down on it. Never before had I heard of them, so the band’s name made me anticipate some sort of a brutal death metal assault but was greeted instead with vintage hard rock in the vein of The Wildhearts and Mötley Crüe’s heavier days. Some very slightly industrial-tinged sound effects in background bring a more modern edge to it but the feel of big hair and pouting en masse is definitely present. Bassist/singer Janne Jarvis has a suitable, gritty voice with a punkish attitude that serves the tale of the twisted celebrity & media culture of today very well. Kudos for the catchy chorus. The fist-pumping drum-beats have an energetic Tommy Lee-vibe to them and the guitars churn with force, although a slightly flashier guitar solo would’ve certainly been in order. The production values bring the package quite distinctly to the new millennium as the sound quality is balanced and powerful. Based on the single, this Finnish/Swedish/British combo packs a mention-worthy punch so North & South, send over some lenghtier discs and we’ll see if the guys can rock to equal measure in a more revealing format.